The French cartoonist Boulet routinely releases brilliant, genre-busting stories, like the magical realist roommate story Darkness or the time paradox romance Paola-4. In his latest short comic story, a princess enters our world thanks to a wizard—and finds her relationship to her rescuer prince vastly changed. Now, you may think at first that you've heard this song before. After all, Enchanted involved a Disney fairytale princess who must adjust to life in the real world. 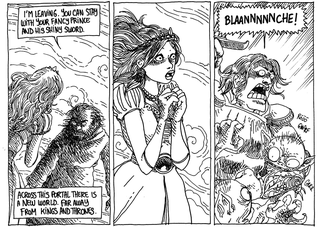 But Boulet's Kingdoms Lost is a quieter, more reflective story. When the wizard Morglox opens a portal from his swords and sorcery world into our real world, the princess Blanche walks through. At first, she expects that her beloved Prince will rescue her, but when it becomes clear that magic doesn't work in our world, Blanche finally decides to explore the city around her—and explores herself for the first time. For the first time in her life, she's able to make her own decisions—and she has to decide whether she prefers the pretty illusions of the world she left behind or the freedom of her new life. And she'll have to decide, in the end, whether she really wants to be saved, or whether she already has been.